Each tree, whether it is a giant oak or a small flowering cherry, should be allowed its own sphere of influence. Other trees that encroach are bound to give a cluttered effect. If you are about to plant a tree, you can readily determine its sphere of influence – or how much space to allow around it. Find the ultimate height of the tree you want to use. Then calculate that tree’s sphere of influence as a circle with a radius equal to the ultimate height of the tree. Thus, a 35-foot tree has a sphere of influence of 35 feet in any direction from the trunk of the tree. Say that the next tree you might want to use has an ultimate height of 20 feet. Then the minimum distance from the trunk of the 35-foot tree to the trunk of the 20-foot tree would be 55 feet, or it might be preferable to have them even farther apart. Once you are committed to using only a few trees you will need to have some way of narrowing down the wide range of enchanting and dramatic trees from which you can choose. The first important design factor to consider in making your choice is scale. Scale is the relationship between the dimensions or sizes of the different elements in a design. The size of a tree sets the scale of your garden picture. When you choose the trees for your garden, notice the relationship between (1) the size of the total area of the garden, (2) the size of the house (which is usually part of the garden scene) and (3) the size of the trees. Suppose your house seems too large for its setting and you want to give it a more gracious aspect. A very large tree will dominate the scene and reduce the apparent size of the house, soften and, at the same time, hold its own against an overpowering architectural mass. Alternatively, if you have a modest little cottage that you want to make more impressive, use several smaller trees. Watch, though, that you do not choose too tiny a tree. If you do, you will find that it will look smaller than it actually is, diminutive, and out of scale. An assortment of little trees tucked around a larger one clutters its sphere of influence, upsets the scale and takes away the feeling of restful spaciousness that is essential to a pleasing design. 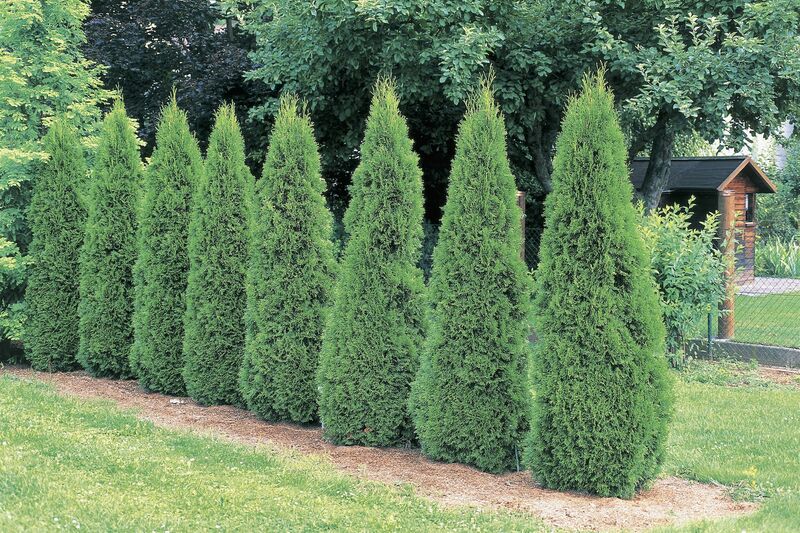 On the average-size suburban lot, you cannot very well use more than four or five trees effectively. In addition, if one of the trees, which you do use, is a large one, you might find yourself limited to two or three, or possibly even one if the tree is a huge old specimen. In other words, if you have a 100-foot tree on a 100-foot lot, its sphere of influence will cover the entire lot. There is an exception to this rule, which might at first glance seem to be a contradiction. Suppose your house is situated in a little piece of naturalistic woodland and you have had the good sense not to chop down all the native trees. Perhaps there are 20 or 30 trees in a comparatively small space. They are mostly of one kind and have grown together for a number of years. Their tops have formed a canopy overhead, but the trunks are bare of branches to a considerable height. Here you have a woodland area that is an integrated unit. Instead of being conscious of the trees as separate and distinct accent points, you find the trunks are more like pillars holding up a ceiling. Trees, which grow together in this way in a happy natural association, form a simple naturalistic unit. You lose this simplicity and get an effect of spotty accentuation if you introduce other trees that are not related in character or in scale to the existing growth. It is better to supplement this native growth with shrubs rather than other trees.